Election 2019: Kerala CPM to join hands with Congress to fight BJP? While the CPM and the Congress have not officially called for an alliance, the two have left space for a coalition after the Lok Sabha polls. Speaking to MyNation, Kerala BJP president Sreedharan Pillai said that the two parties are scared of the BJP. 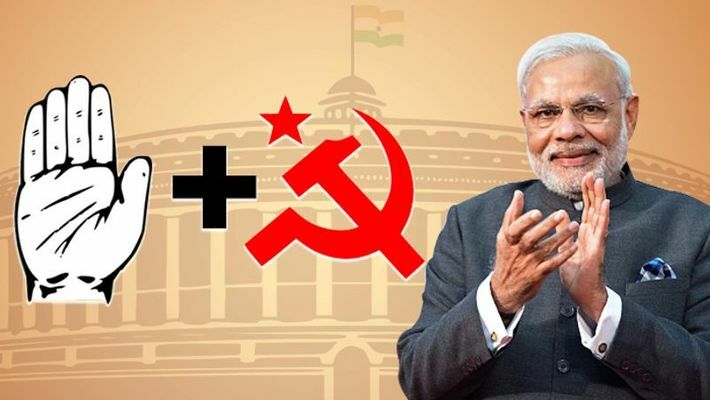 Kochi: While the 2019 Lok Sabha polls are just around the corner, speculation is that Kerala's ruling Communist Party of India (Marxist) and the Congress are all set for a "tactical alliance" . During a public meeting in Kerala, Congress chief Mullapally Ramachandran said that the Congress is ready for a discussion with the CPM's Kerala unit to form a secular front and fight fascism. However, the poll strategy would be based on local sentiments. "The Congress has said that if the CPI(M) assures non-violence in the state, the party would throw its doors open for an alliance. A decision would be taken after the committee meeting. Both the parties want Rahul Gandhi as the PM," said PC George, MLA. While the Congress and the Left parties are deliberating on a tie-up in West Bengal, would they follow suit in Kerala? Speaking to MyNation, Palakkad CPI (M) MP, MB Rajesh, said that the Congress and the BJP are arch rivals of the CPI(M) in the state. "There is no question of CPM aligning with the Congress," said Rajesh further adding that defeating the BJP in the state would be their priority. However, the CPI (M) is in a quest to increase in the number of Left members in the parliament, and with the post-poll results, the party may consider an alliance. "We want a secular government at the Centre. Depending on the results, the post-poll scenario will definitely be thought about," said Rajesh. Congress leader KC Venugopal, however, denied an alliance vehemently. He said, "Presently, I don't think the alliance would take place between the parties. But, both the parties' priority is to defeat the BJP in the state. Already UDF and LDF are fighting. But, when it comes to the national level, the picture is different. It also depends on the post-election scenario." The BJP has captured the Hindu (with majority forming the CPI(M)'s support base) emotions with their concerted efforts in the Sabarimala issue. And Hindus form about 56% of the population. BJP leader Sreedharan Pillai said, "The CPI(M) and the Congress are now in an embarrassing position. The Communist party is confined only to Kerala now. The possibility of their alliance clearly shows that they are afraid of the BJP and this will be an unholy alliance in Kerala." The BJP garnered a vote share of 11% in the state Assembly elections in 2016. The party managed to win a lone Assembly seat then. Today, the party aims to maximise on the 20 Lok Sabha seats.